green | Exciting Adventures of an ex-Archaeologist, soon to be Teacher! Not yet 30 but making cushions? 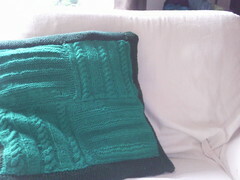 Well, nevermind your comments as this latest knitting project is comfy comfy goodness! Backing is the bit from cutting our new curtains to size and the front is emerald green (just not in this photo) wool from k1 yarns in Edinburgh. There aren’t too many noticeable mistakes really, not bad for my first attempt at making patterns and things out of my head. I shall reward myself 7 out of 10!